Provide comfort for the family of Lois Idleman with a meaningful gesture of sympathy. 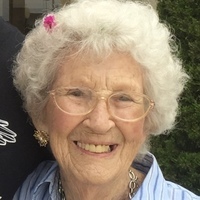 Lois Ruth Idleman, age 99, graduated from mortal life into immortal life eternally experienced in the presence of her Savior and Lord Jesus Christ at 5:45 PM, Friday, March 29, at the St. Luke’s Nursing Center, Carthage, MO. Her greatest joy in life was investing sacrificially in her family, her church family and her friends. She was preceded in death by Kenneth her husband of 76 years. Their marriage produced a family tree of 4 children, 14 grandchildren, 34 great-grandchildren and 10 great-great-grandchildren. She was revered and loved by all who knew her. She was an avid quilter and found great joy in designing, crafting, sewing and giving her quilts and Raggedy Ann dolls away to family members and special friends. During her younger years, she was a faithful Bible teacher and volunteer. She loved people and loved being with people at every opportunity. She kept a prayer list with the names of her loved ones for whom she faithfully interceded. Lois modeled the abundant life Jesus promised to give. Optimism and joyful spirit marked her well lived life. Services will be at 11:00 am Tuesday at the Mason-Woodard Chapel. Burial will be at Ozark Memorial Park Cemetery. Visitation will be at 10:00 am Tuesday until the service at the Chapel. Memorial contributions are requested to Ozark Christian College in care of the Mortuary. To send flowers in memory of Lois R Idleman, please visit our Heartfelt Sympathies Store. Okolona Christian Church Staff and Elders sent flowers to the family of Lois R Idleman. Ken Idleman, son of Lois, has been a friend for many years and I am so sorry to see his mother passing but know she is in the arms of Jesus. Prayers for Ken, Kaylene, and family. Pastor Ken and Kaylene-So sorry to hear of the passing of your dear mother. I attended Crossroads Christian in Evansville when Pastor Ken was still preaching there and always enjoyed his stories about his mother during the sermons. I have no doubts she is in the presence of our wonderful Savior. Sending prayers for comfort for your family. Our deepest thoughts and prayers to you and your family. We are so grateful for you and your ministry to OCC. Okolona Christian Church Staff and Elders purchased the The FTD Deepest Sympathy Arrangement for the family of Lois Idleman.